Congratulations Juanito “Boy” Gionson, NDFP #3 ranked player, for winning the recently concluded Philippine Qualifier to the World Darts Championship. Gionson prevailed over Andy Villamor, NDFP #15 ranked player, by a score of 3-1 sets in the decision set after Villamor won the first set 3-2. Going in to the step ladder format, Gionson has the twice to beat advantage by topping the round robin of the last eight players. Boy Gionson is one of the hottest players in this year’s NDFP National Ranking Circuit winning the Open Singles of the 200K Lhuillier National Championship in Cebu City and the 120K Nom-e Open in Carmona Cavite. Gionson also won last year’s Robson’s Summer Dartfest and the Governor Deloso Open in Zambales. 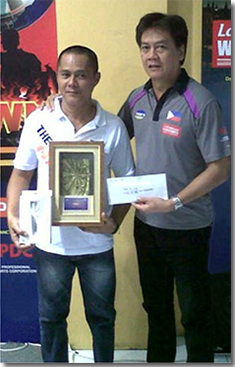 By winning three (3) major tournaments Gionson is one of only seven (7) National Masters of the National Darts Federation of the Philippines. Andy Villamor of Bukidnon recently won the Kadayawan Open in Davao City and the runner up in the Hinugyaw Open. Coming in 3rd place is JP de Tablan, the three (3) time youth champion of the Darterong Pinoy and Jun Espinola, NDFP #14 ranked player from Cagayan de Oro, came in 4th. Rounding the top eight (8) in the finals are Ricky Mijares, Arby Briones, Robert Reyes and Cris Salinas. We wish Boy Gionson all the best in London and we thank Jojo Claudio, the PDC Philippine Representative for hosting the qualifier.